The Fight for 15: It’s a bad idea. Raising the minimum wage to $15 would hurt millions of vulnerable people. Increasing the minimum wage so dramatically will damage the economic prospects of millions of vulnerable people. 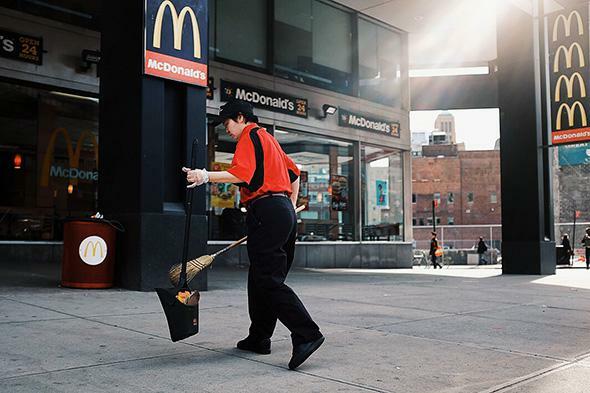 A McDonald’s employee sweeps up in front of the restaurant on the morning when thousands took to the streets to demand a $15 minimum wage on April 15, 2015, in Brooklyn, New York. The “Fight for 15” is just getting started. Last week, protesters gathered in cities across the country to demand a $15 hourly minimum wage, and at least some national politicians are heeding their call. Martin O’Malley, the former governor of Maryland who is positioning himself as Hillary Clinton’s liberal rival for the Democratic presidential nomination, endorsed a $15 minimum wage, and it’s all but certain that other Democrats will soon follow. So might a handful of Republicans looking to demonstrate that they too care about stagnant incomes for low-wage workers. Minimum wage ballot initiatives passed by substantial margins in four Republican-leaning states in November, and GOP Senate candidates Tom Cotton of Arkansas and Dan Sullivan of Alaska came out in favor of state (but not federal) minimum wage hikes. None of this should come as a shock. Public support for a minimum wage hike is overwhelming. One recent survey, sponsored by the National Employment Law Project, found that 63 percent of Americans favor increasing the minimum wage to $15 over the next five years, and that a more modest increase to $12.50 is backed by 75 percent of Americans, including 53 percent of Republicans. Opposing a minimum wage increase could be hazardous to your political health, and my guess is that opponents will prefer to dodge the issue than to engage it head on. Why beat your head against the wall when you can just go with the flow and embrace a very popular idea? I can think of only one good reason: that increasing the minimum wage so dramatically will damage the economic prospects of millions of vulnerable people. My view is that the labor market is changing in ways that make huge minimum wage hikes, like the one backed by the Fight for 15 movement, very dangerous. First, let me stipulate that there is a lively, ongoing debate among serious, thoughtful people about the wisdom of more modest increases in the federal minimum wage. For years, scholars have been drawing on variation in minimum wage levels across states to determine whether minimum wage hikes reduce employment levels. Can we discern the effects of a minimum wage hike by, say, comparing two neighboring counties, one in which the minimum wage increased and the other in which it did not? Can we screen out all of the nonrandom differences between states and cities that might influence their local minimum wage laws? I’m skeptical, but many scholars, like University of Massachusetts–Amherst economist Arindrajit Dube, have tried to do just that. Dube and his collaborators have concluded that modest minimum wage hikes don’t appear to reduce employment levels. Other economists, like David Neumark and William Wascher, disagree. What does it mean for different states to have different capacities to absorb a higher minimum wage? Consider the contrast between Massachusetts, a high-cost, high-wage jurisdiction, and Mississippi, a low-cost, low-wage one. In Massachusetts, very few workers would be affected by an increase in the federal minimum wage to $10.10, as the Bay State already has a $9 minimum wage that is set to increase to $11 by 2017. But in Mississippi, as many as 28 percent of workers would be affected. In Massachusetts, wages are higher, and so are prices. Relatively few employers will have to spend substantially more on their workforce under a higher federal minimum wage, and relatively few will have to raise their prices to account for it. In Mississippi, by contrast, many employers will have to raise their wages, and it’s a safe bet that virtually all of the cost of this minimum wage hike will be passed on to consumers in the form of higher prices. You might think that, well, this isn’t a huge deal if it’s rich people who are paying these higher prices. But of course it will often be poor people who pay them, particularly in a poor state like Mississippi. This makes poor consumers worse off in a direct sense, in that they can purchase less with their earnings. And if consumers are at all sensitive to prices, at least some of them will choose to spend less on labor-intensive goods and services now that they are more expensive. That could reduce the number of minimum wage jobs available. That is why Dube recommends that state and local governments set minimum wages that take into account local wages and local price levels. Specifically, he advocates setting a minimum wage at half of the median full-time wage in a given jurisdiction, a standard that would have yielded minimum wages ranging from $12.45 in Massachusetts to $7.97 in Mississippi. Suffice it to say, there is a great deal of distance between $7.97 and $15. It could be that Dube is a right-wing agitator and friend of the plutocracy who can’t be trusted. I tend to think he’s a sober, cautious scholar who recognizes that raising the minimum wage involves tradeoffs. The truth is that I go further than Dube. One reason is that I’m not sure looking at short-run employment effects is the right way to understand the impact of the minimum wage. When gas prices start to climb, consumers don’t respond immediately by replacing their gas-guzzlers with more fuel-efficient vehicles. They drive a bit less, depending on how high prices have gone and how much control they have over their commutes. But it takes them a bit longer to replace the cars they drive. What actually happens is that consumers scrap their gas-guzzlers faster than they would have otherwise, and when they do replace their cars, they replace them with more fuel-efficient models. Could there be a similar lag when it comes to the minimum wage? It could take time for low-wage employers to develop business models that allow them to get away with fewer less-skilled employees, meaning that we don’t see the full effect of a hike right away. The economist Isaac Sorkin has made a compelling case that to really understand the impact of minimum wage laws, we need to have a much better understanding of these long-run effects. But even if we completely ignore the possibility that firms will learn to economize on less-skilled labor, $15 an hour is a bridge too far. My deeper concern is that people who in decades past might have had a fighting chance at making their way into the middle class are now finding it hard to get on the bottom rungs of the job ladder. This matters because low-wage employers aren’t just employers. They’re also institutions that invest in the human capital of their workforces. Some people learn the basics of what it takes to get and to keep a job (the ability to exercise self-control, to be persistent, to show up on time, to get along with others, to speak the language of your workplace reasonably well) from their parents. Formal education also helps, but not everyone flourishes in formal education. Even the most heroic and dedicated public school teachers can only do so much to close the gap between kids from stable, supportive families and kids from fragile ones. Low-wage employers take on the challenge of succeeding where families and schools have failed. They don’t do this because they’re saints. They take on this challenge when they have no choice—they’d much prefer to hire workers who are already fully qualified to take on demanding jobs than to nurture talent in-house. What happens when they do have a choice? Firms are losing interest in financing the training of their employees. Peter Cappelli, director of Wharton’s Center for Human Resources, notes that although “employers in the postwar era typically selected employees for general abilities at entry-level positions, then trained them over a lifetime to meet the employers’ needs,” things have changed. Though employers don’t generally say this outright, the new expectation is that “job candidates’ skills, which are either adequate or not, are supposed to arrive with the applicants.” There are many theories as to why this has happened. One obvious possibility is that firms have grown less willing to train workers in-house as skilled employees have grown more footloose, and they are reluctant to spend time and resources training workers who will eventually wind up at other firms. Where does this leave job candidates who don’t arrive readymade, with all the skills they need to climb the corporate ladder thanks to Mom, Dad, and good old Selective U.? It leaves them in a really tough place. Employers will give these employees a shot only if it’s not too expensive for them to do so. As the wage floor rises, why wouldn’t employers hire more experienced workers or workers with fewer personal challenges, who need less hand-holding in their first months on the job? A higher minimum wage could be good news for people who are willing to work at today’s minimum wage. Yet it might also draw in, say, candidates from more affluent backgrounds who will now compete for the same jobs. Then, of course, there is the possibility that employers will hire fewer, better-skilled employees and augment their pricier labor with machines. This doesn’t strike me as a good time to decide that jobs paying less than $15 an hour should literally be against the law. There are millions of people—struggling teenagers, less-skilled immigrants, people who’ve been unemployed for years, ex-offenders who are trying to get on their feet—who need on-the-job experience if they’re ever going to be in positions to command higher wages down the road. Let’s increase wage subsidies for low-wage workers. Let’s expand apprenticeship programs. Let’s try all kinds of things, like celebrating employers that successfully upgrade the skills of their low-wage workers and not just the Googles of the world, which hire only the high-skilled and expect to get patted on the back for it. But let’s not lock millions of people out of entry-level employment by raising the minimum wage to $15 an hour.